Comments are disabled because I got tired of the endless spam. For questions, comments, and/or dilemmas, email th@thallenbeck.com. 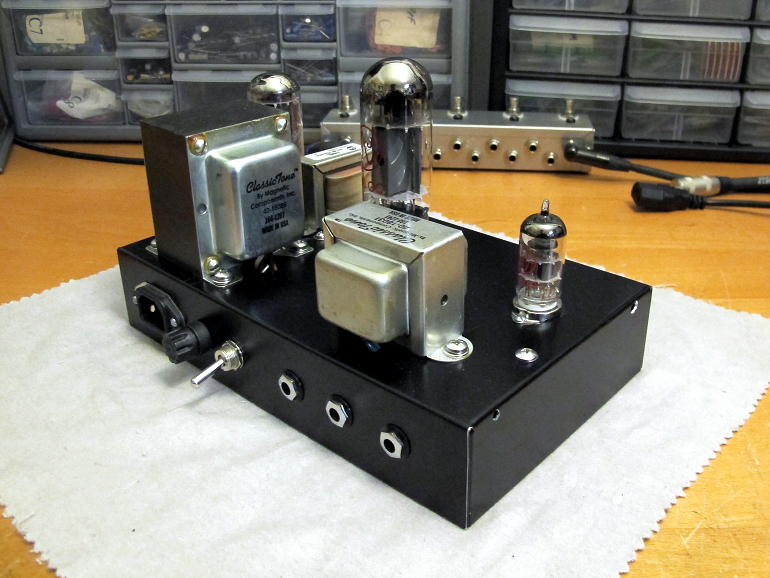 This is my first single-ended amp build. It puts out about 5 Watts, which is plenty loud, but not bonecrushing. It’s based on the Fender 5f2 “Princeton” circuit, which is quite similar to the 5f1 “Champ,” the main difference being that the 5f2 has a tone control. This is not a kit – the chassis, cage, and filter choke are from Hammond and I kind of winged it with the drilling. The transformers are from Classictone and the tubes are JJ. Princeton/Champ DIY builds have been done many times, but now that I’ve built my own, I can see, and hear why so many people like having at least one of these around. If you see anything I’ve said here that might be inaccurate or wrong, please let me know so I can correct it. 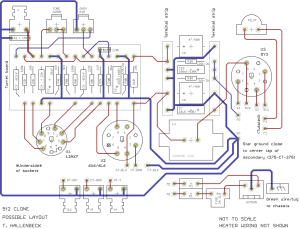 Below are the schematic diagram for this build (left) and a possible build layout (right), and a video to prove that my latest squid launcher actually works. 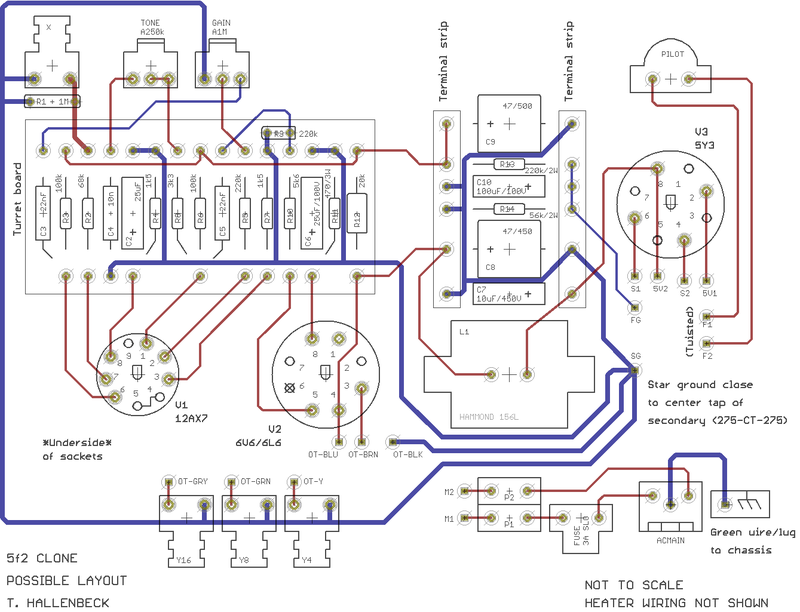 The layout diagram is close to what I actually built but not exact, and it’s not to scale – it just shows where things can go for minimal wire-crossing and halfway-decent ground distribution. 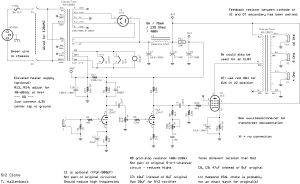 Take the layout diagram with a grain of salt – the resistors that connect directly to the grid inputs of the tubes (R2, R5, and R10) really should be soldered directly to the socket pins, with as little exposed lead as possible. Also, the cathode resistor for the power tube (R11) probably should be rated > 3W. 1. Different location for the ‘tone’ control. I put ‘tone’ in quotes because it’s just a low-pass filter. For this build, ‘tone’ is situated after the second triode just before the power stage, as a 10n capacitor to ground and a 250k pot. 2. Larger values for the B+ filter capacitors. 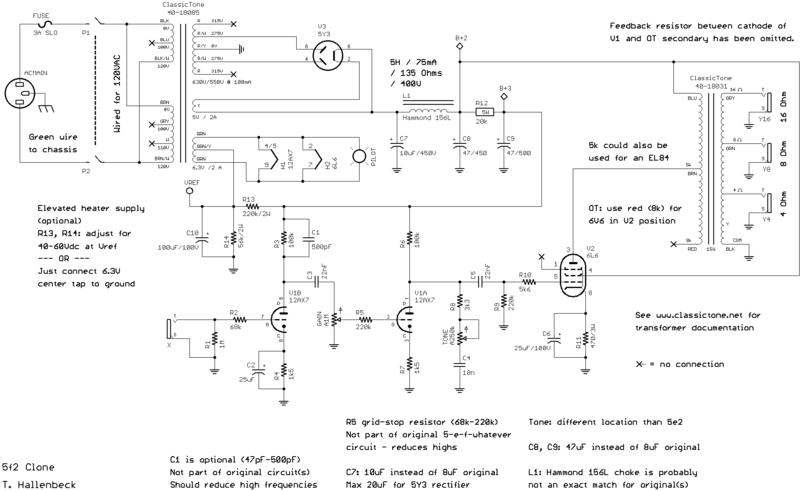 The 5f2 used ~= 8uF whereas this build uses a 10uF after the rectifier, and 47uF for B+2 and B+3. 3. 6L6 power tube instead of a 6V6. I like 6L6 in general. 4. The 5f2 had a feedback resistor between the secondary side of the output transformer and the cathode of the second triode stage. This build doesn’t. Originally I had one but I thought it made single-coil pickups sound too harsh so I got rid of it. 5. 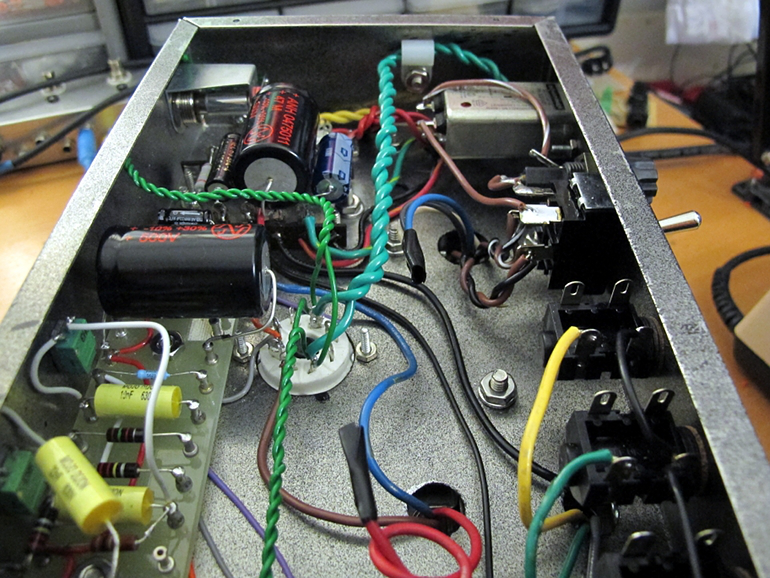 This build has a (relatively) large bypass capacitor in parallel with the plate resistor of the first triode stage. It rolls off high frequencies and helps to alleviate the ‘icepick’ effect at high volumes. 6. 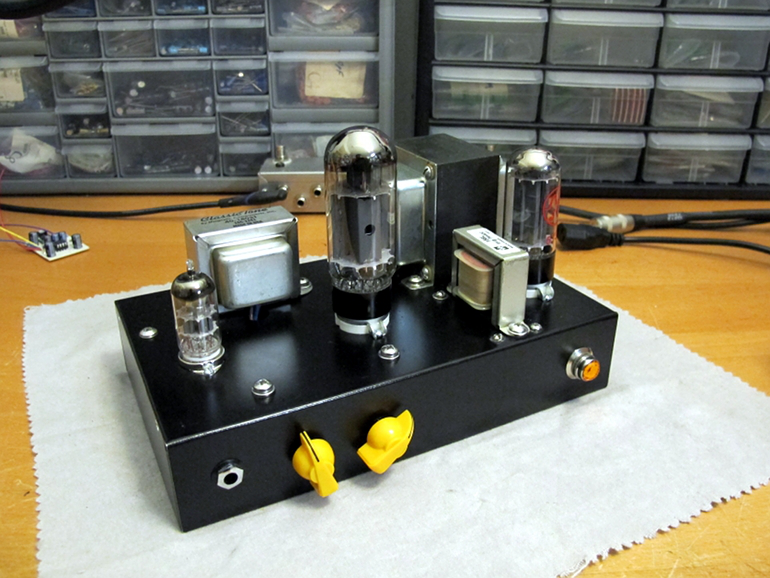 This build has a 220k grid-stop resistor at the input to the second triode stage of the preamp. Like the cap mentioned in #5, it helps to roll off high frequencies. 7. 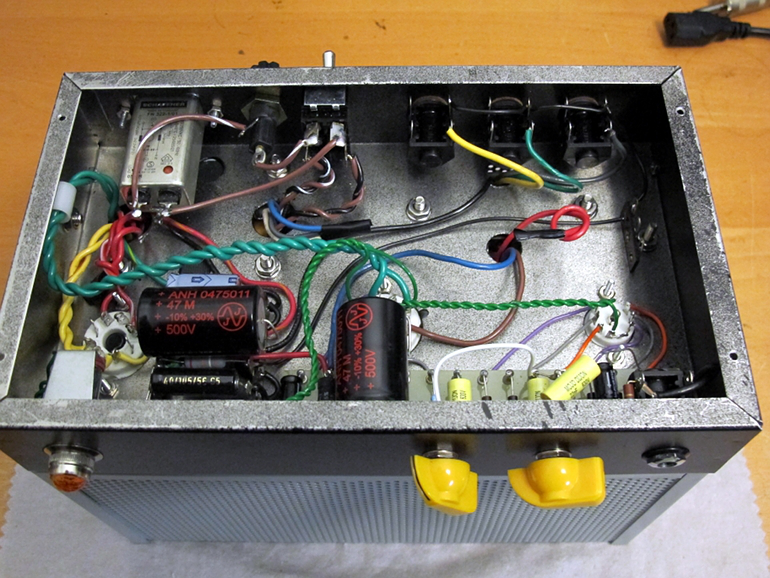 This build uses an elevated heater supply (see schematic) with a DC offset of about 45 Volts for the filaments, to reduce AC hum. 8. This build has separate outputs for 16, 8, and 4 Ohms. The 5f2 usually had a single output. I’m sure there are other differences I’ve forgotten to list. 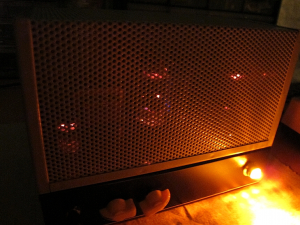 There is a little AC hum but it’s quickly overpowered as the volume knob goes up. Overall, the build is a little messy – I didn’t really know how it would go together when I started it, and I made a zillion little tweaks to it. I left the transformer leads a little bit long in case I reuse the transformers for other projects. Next time, I’ll use a chassis that’s higher than 2 inches, and a little wider for better component spacing – the choke just barely fits. 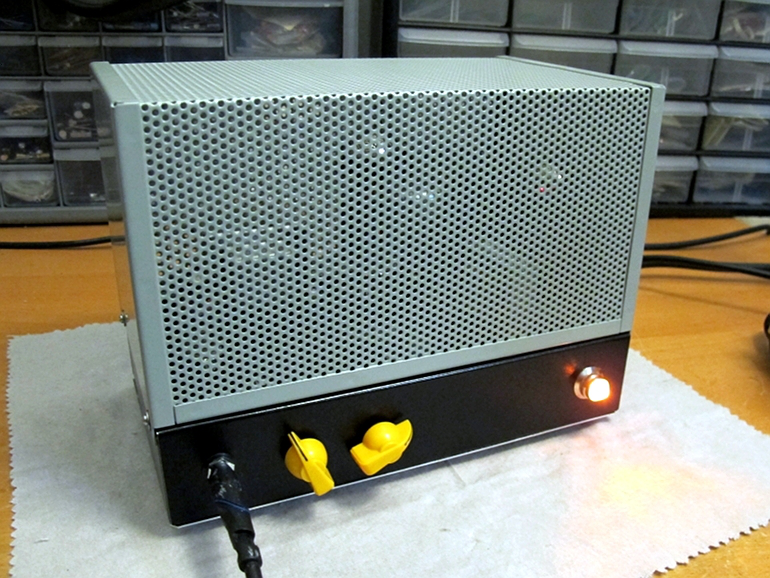 Near as I can tell, I’m getting about 5 Watts at the output (assuming 50% loss for a single-eneded output transformer). That’s plenty of cowbell for just sitting around playing. Like the original Champ, this build does not use a master volume control. That means the power stage is always running near full boil. As the Gain knob goes clockwise, the volume increases, but so does the clipping. 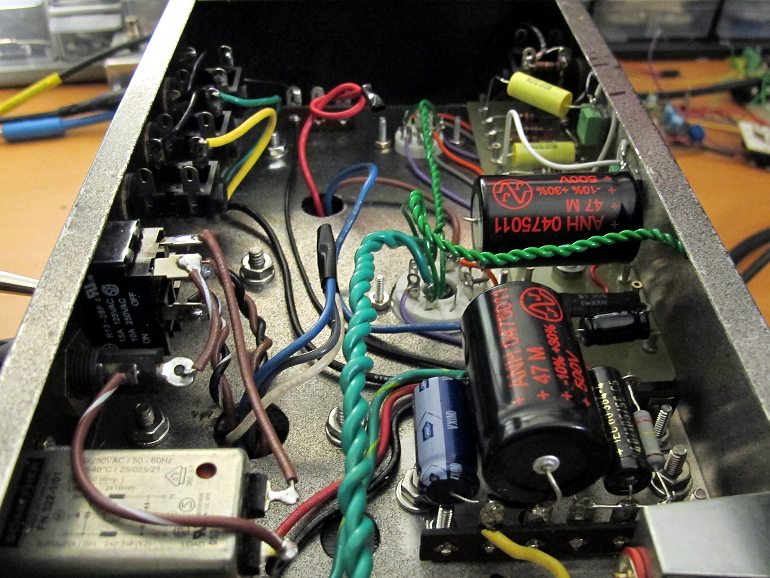 The Classictone output transformer I used (40-18031) has two different leads for 5k and 8k primary impedances. I’m using 5k here for a 6L6. 5k would also work for an EL84. 8k would be good for a 6V6. 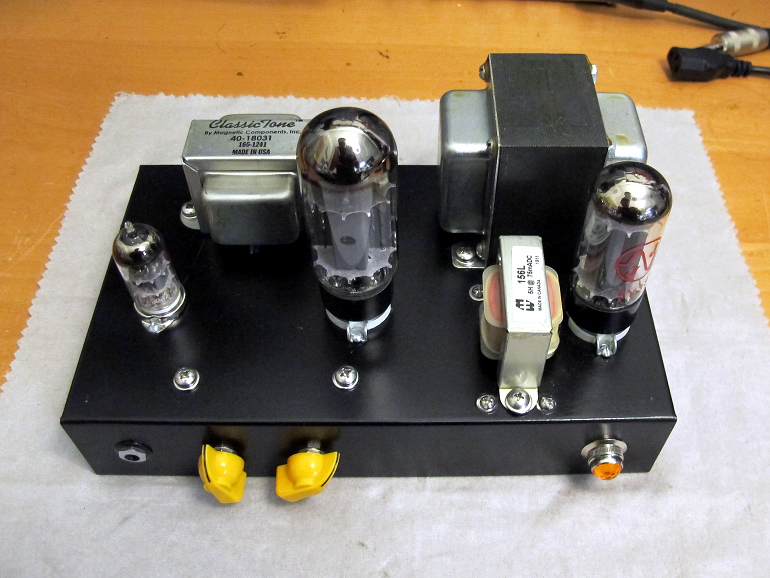 Above, from left: 12AX7 preamp tube, 6L6 power tube, 5Y3 rectifier. All the tubes are JJ. I’ve been getting good results with JJ tubes lately, especially the JJ 6L6. The ‘sag’ from the 5Y3 rectifier is really obvious in the sound of the amp: to me, it’s like the signal is hitting a rubber wall when I lay into the strings. The knobs, from left, are volume and tone. There is no ‘master’ level control. 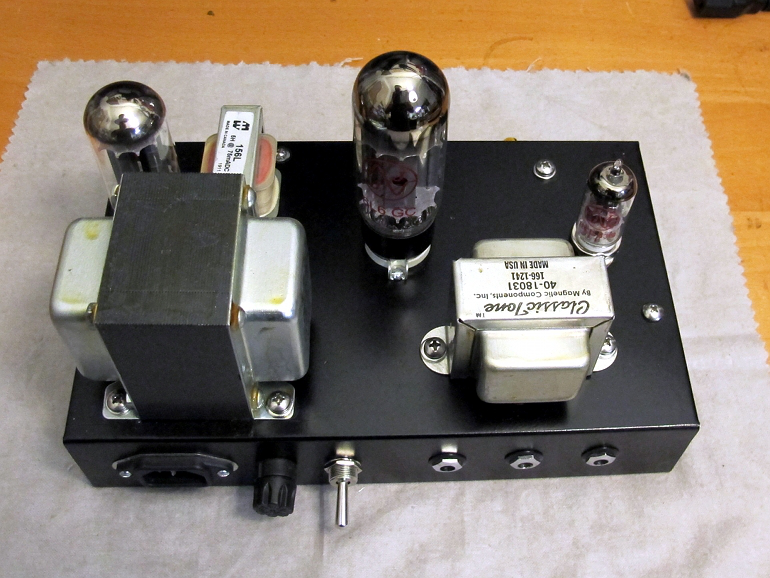 The volume pot controls the strength of the signal from the plate of the first tridoe stage in the preamp to the grid of the second triode stage. Below are photos of the interior. It’s pretty obvious that I had some issues with the layout. For this build, I tried ‘floating’ the filament wiring (green twisted wires) instead of having them hug the chassis. 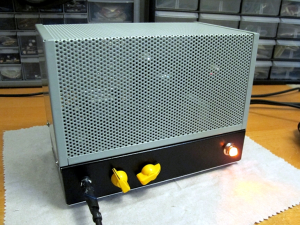 This entry was posted in D.I.Y. Amps and tagged 5f2 clone, Champ clone, D.I.Y. 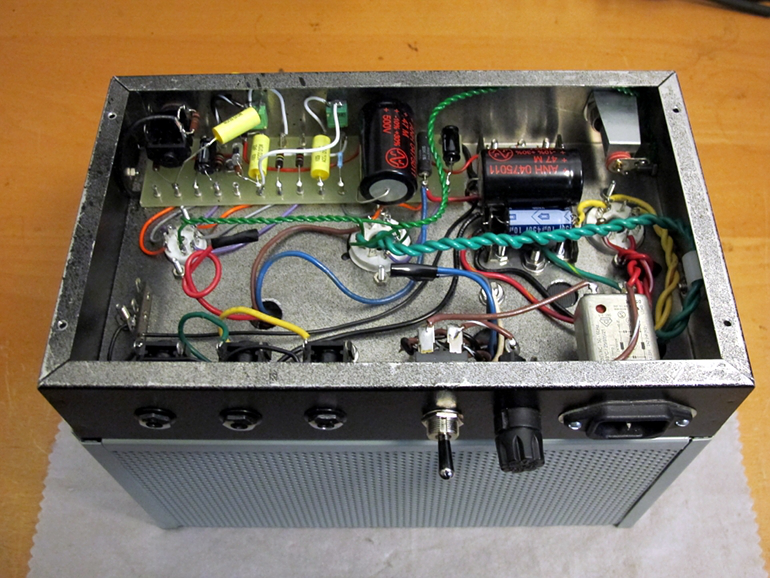 guitar amp, DIY guitar amp, Fender clone, Princeton clone on December 7, 2013 by thallenbeck.